Sweet looking animal faces greet children from their pens inside the barn. The sounds aren't much, so maybe no batteries are needed. Six friendly and cute looking animals, along with Farmer Eddie, wait to be led out of the barn and into the lush meadows of the living room, the kid’s bedroom, or the front yard. Open the gates to hear one of the animal sounds or a short tune. Overall, we think the animals are the best part of this toy. They’re sturdy, adorable, and the perfect size for small hands. Users give positive feedback for the animals, though a number have expressed disappointment with the barn. 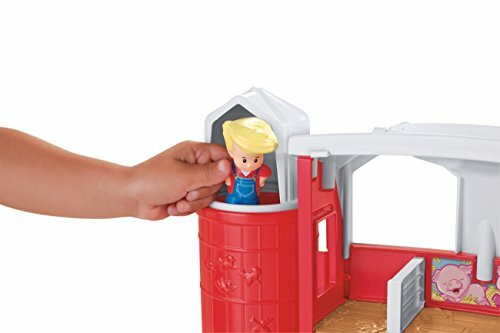 The “drop-through fun” of the silo isn’t likely to hold a child’s attention for very long, and the animal sounds made by opening the gate is pre-determined, so children don’t necessarily associate the sound with a particular animal without adult interaction. The older version of this set was recalled due to screws coming out, so make sure to get this newer version, which has a white handle on top. 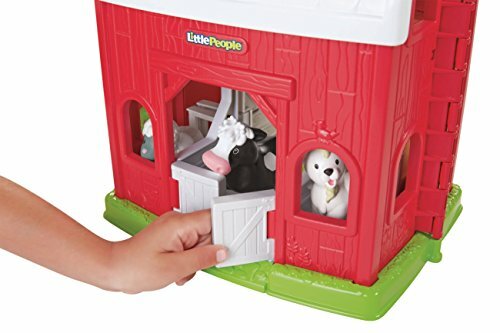 Plastic barn opens up to reveal animal stalls and a loft, with plenty of room for the included animal friends. 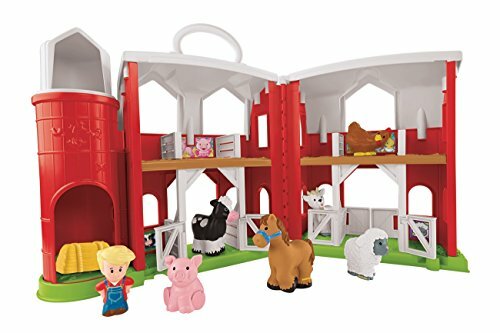 The playset includes Farmer Eddie, a horse, a cow, a pig, a goat, a chicken, a sheep, and a hay bale. The silo is hollow with an opening at the top, so the figures can be dropped down and slide out the bottom. Opening the barn gates will activate either one of the animal noises (a neigh, a moo, an oink, a bleat, a cluck, or a baa) or a short little tune which seems to represent the sound for Farmer Eddie. The playset requires 2 AA Batteries for sound activation, and a Phillips screwdriver for assembly. It comes with batteries already installed, but they are really only meant for in-store demo purposes, so we recommend getting additional batteries. The barn folds up, with room to store all the figures inside. Pretend to work on a farm, or a Red Animal Mansion, as one child put it. Opening the gate activates one of the animal’s sounds. The animals are cute, friendly looking, and a very nice size for small hands to hang onto. Some users have complained that unlike older models, these have no moving parts. While we certainly understand how older children may be more interested in toys with moveable parts, we also know that solid toys means bits are less likely to pop off and become a choking hazard. Recommended for ages 1 to 5, the animals are not likely to be choking hazards. The hay bale, on the other hand, may be put into a mouth by a very determined child. Several users have mentioned that the barn doesn't latch closed very well. It can store the animals and be placed on a shelf and left alone, but trying to carry it around by the handle usually results in the latch coming undone and the pieces going everywhere. We've seen this toy pitched in several places as being "educational." To clarify, the sounds are generated with no connection to correlating animal. An older model used to have connectors on the animals that would activate that animal's sound when touched to the barn floor, but alas, this model just makes a noise when the gate is popped open. Children who already recognize the animal sounds will know which animal is being referenced, but younger children will have no reason to connect the toy animal with the sound. Based on this, we disagree that this toy is educational in that manner. However, playing with children, and talking them through the names, sounds, eating habits, and other characteristics of the animals IS educational. The figures can be dropped down the silo, though because it's just a straight drop down, we aren't sure how long a kid will find that entertaining. There's no ramp, no slide, or anything else to slow down the fall, so there's not really a lot going on after the toy is let go. We think the animals are the best part of this set. They're easy to handle, cute, and durable. We found that many kids enjoyed taking the animals and having them go on adventures through the living room, or outside where they could "live free" or in homes made of mud and sticks. We’ve listed some animal sets under Parts and Pieces. This playset is not the Little People Fun Sounds Farm. The Fun Sounds playset has some fence pieces, and can alter between day and night, which changes what set of sounds are available. 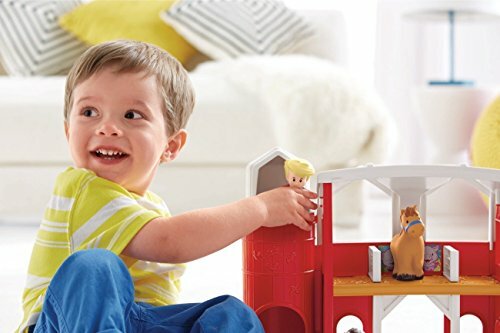 The Fun Sounds set can be connected to some other playsets from the Little People series, while the Animal Friends Farm cannot. 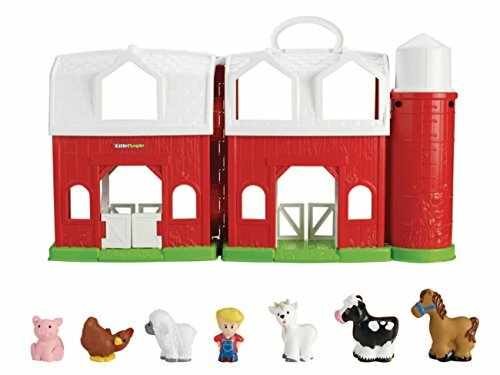 The Animal Friends Farm comes with more animals, so that is the set we would likely choose out of the two. A much older version of this toy, from 2002 has been recalled due to screws occassionally falling out, becoming particularly dangerous choking hazards. It hasn't been on the market for quite some time, but may be found at garage sales, so please be aware. 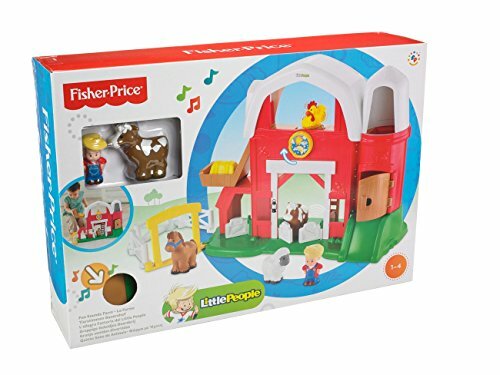 The bad version can be identified by the yellow rooster on the top of the barn, as shown in these pictures from the Fisher Price website. If interested in buying just the Little People animals, here’s a few sets we like. We don’t think the animals are small enough to be a choking hazard, though we still recommend supervision be used with children who still experiment with putting objects into their mouths. Fun on the farm for toddlers! 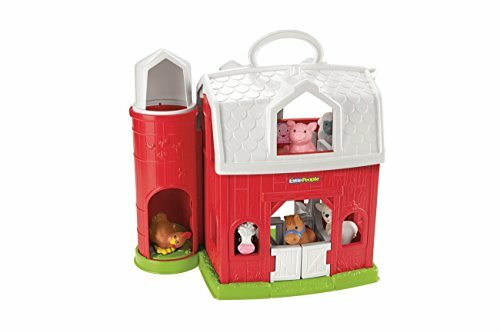 The Little People® Animal Friends Farm is filled with animals and down-on-the-farm fun! Open the barn door or the gate to hear animal sounds or a fun farm tune. 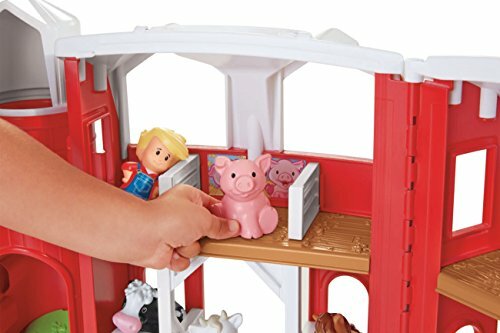 Little farmhands can help Farmer Eddie™ place the animals in their stalls by matching them to their pictures. Drop the hay bale (or even the animals!) through the silo for even more farming fun!